The International Monetary Fund (IMF) thinks the global banking system is getting better. How so? Its latest report cuts the amount of toxic waste it thinks global banks will need to write off by $600 billion -- 15 percent less than its previous estimate of $4 trillion. Nevertheless, the IMF still believes that banks need to raise hundreds of billions in additional capital. And given all the looming risks, it may be overly optimistic. 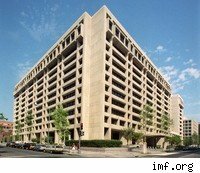 Before getting into the details of the IMF's latest report, let's take a look at what the IMF is and why anyone should care what it says. The IMF was created at a UN conference held in Bretton Woods, N.H., in July 1944 to stabilize world currencies, promote global growth and provide capital in a financial crisis -- it committed $165 billion to help resolve the current one. The IMF's latest Global Financial Stability Report estimates that the losses from the financial crisis between 2007 and 2010 will total a mere $3.4 trillion because the world economy is growing faster than the fund expected. Specifically, it has raised its 2010 growth forecast from 2.5 percent to 3 percent. Surprisingly, the IMF has concluded that recessions in France, Germany and Japan have officially ended. And we know the Fed thinks the U.S. slump is nearly over. But the IMF sees a big cloud on the horizon: commercial real estate. It estimates that 12 percent of U.S. banks have five times their capital exposed to commercial real estate loans. As I posted nearly a month ago, commercial real estate is a $6.7 trillion loan market, and the rate of delinquency on those loans is up six-fold since last year. The IMF calls for banks to raise capital and for governments to reform the banking system. The group believes that banks still need to raise $460 billion worth of capital -- $80 billion in the U.S. and the balance in Europe. It wants governments to boost bank capital requirements, implement effective ways to get bad loans off bank balance sheets, and avoid rescue plans that create new crises. Is the IMF including the cost of writing off bad commercial real estate loans in its $3.4 trillion estimate? Since the efforts to rid banks of toxic waste are proceeding so slowly, how did a slightly higher 2010 economic growth forecast result in a 15 percent drop in its loss estimate? At what price will banks be able to raise the $460 billion capital the IMF recommends? Given the record level of competition for jobs in the U.S., how can the IMF be sure that any recovery will not be followed by a double-dip recession due to the global economy's heavy dependency on U.S. consumer spending? It remains to be seen whether these questions have a happy answer. If not, the IMF could soon find itself back in the financial rescue business. Peter Cohan is amanagement consultant, Babson professor and author of eight books including, You Can't Order Change. Follow him on Twitter.